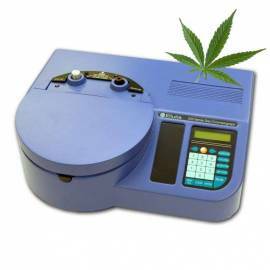 Equipment for the analysis of Cannabis to determine patterns of taste, purity, potency and safety. Determines the composition cannabinoids, terpenes, heavy metals, pathogens and mycotoxins, solvent content and the presence of pesticides and herbicides. Ellutia 200 Series Compact GC with FID detector. Gas chromatograph compact, lightweight and easy to use. Analyses of simple and economical your samples of medical cannabis or recreational purposes to provide a quality product. Determines profiles of taste, absence of pesticides and solvents used during the extraction and potency levels of THC and CBD. The computer is ideal for users without experience in chromatography. Reduces cost and time of analysis per sample.